No sooner is the new project plan signed off than something changes. A project plan is simply an estimate of the work required to achieve the project ‘s goals, spread over what is hoped to be a realistic timescale. Yet, for all but the simplest projects, progress is unlikely to go according to plan. Measuring project progress is essential if unpleasant surprises are to be avoided later on. The prudent project manager will want early warning of any variances from the plan, so that there is time for corrective action to pull the project back on track. It is not good enough to simply compare the actual effort expended (from timesheets) with that planned. There must also be an objective measure of what’s been achieved – see my December blog on Earned Value. Without this, the picture of progress can be highly misleading. The first step is to maintain the accuracy of the original project plan. It is the baseline or yardstick against which project progress is measured. So the original plan must be reviewed and modified as changes in scope are agreed, or realization dawns that the original estimate was over-optimistic. 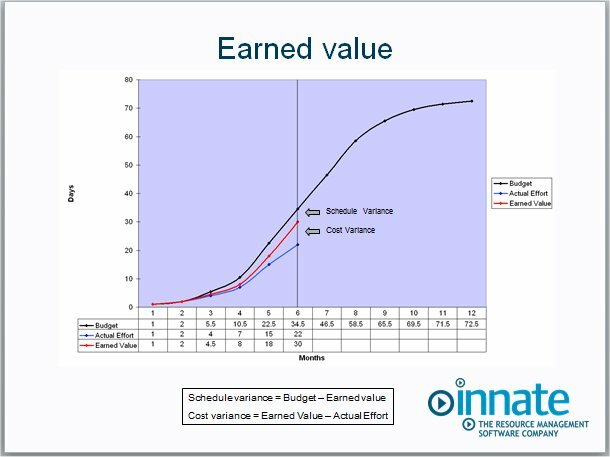 Chart showing Earned Value measurement, but how accurate is the budget baseline? Secondly, unrealistic assessments of progress to date will lead to unreliable estimates of the work remaining to complete the project. For individual projects, this can jeopardize key delivery dates and risk disappointing the client. But in a multi-project environment, such estimating errors will be compounded and effective use of the resource pool won’t stand a chance. Resource management systems can help to restore order. 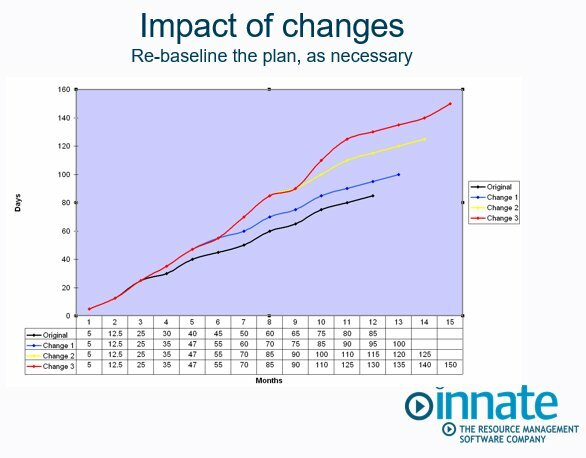 By enabling new project baselines to be taken as part of a formal change control process, the accuracy of the yardstick for measuring project progress can be maintained. This is the first and most important step in maintaining realistic estimates of remaining work. It is the foundation for measuring project progress. As confidence in each project’s estimate improves, utilization of the resource pool will increase, as will overall profitability. ‹ Optimizing resource utilization – How Earned Value measurement helps.